With renowned developer WMS Gaming virtually sewing up the ‘Native American’-themed slots in land-based casinos with their hugely popular Buffalo series of games such as Buffalo Thunder and Buffalo Spirit, trust slot developer Microgaming to gatecrash the party. 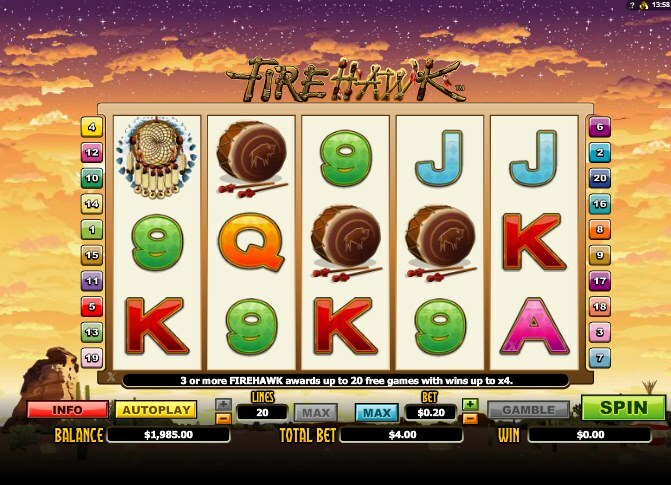 First the leading slots developer release Eagle’s Wings, a soaring ode to American nature and the icons of native American tribes, now they release a far more blatant celebration of the American tribes – Fire Hawk. 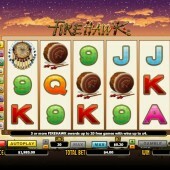 This is not an ordinary run-of-the-mill slot. This is a great dedication to the history of the Native Americans and everything that their culture stands for... represented in slot form. There is a lot going on here for fans of the Native American slots genre and those that are just keen slots players. A 5 reel, 20 pay-line slot, the game at first looks fairly basic: a rudimentary sunset over the prairies in the background and some basic 10-through-Ace poker symbols on the reels, but the attention to detail on the native icons is terrific. Mingled among the standard poker symbol fare we get various tribal artifacts like peace pipes, drums and dream catchers, as well as an Indian Chief and a female member of the tribe. The woman pays out the most, a 6,000-coin jackpot for hitting five on the reels (which, at $10 a coin, makes for a massive haul), while the fearsome looking Chief acts as the game’s Wild. He appears on reels 2 and 4 only, but does substitute for all regular symbols other than the Scatter. 20 Free Spins or 4x Multiplier - You Choose! The titular Fire Hawk, rising like a phoenix from the flames, is the main Scatter. Three or more anywhere on the reels triggers a neat little animated sequence – as well as a juicy free spins feature bonus. You’ll get to choose from three options: 20 free spins with a 2x multiplier, 15 spins with a 3x multiplier, or much fewer spins – 10 – with a better multiplier (4x). If you’ve gotten a taste for Native American slots action after playing Fire Hawk, make a beeline for the Buffalo slots I mentioned. Elsewhere, Cryptologic’s Indian-themed Native Treasures slot has similar free spins and a Chief Wild, as well as bald eagles everywhere you turn.